Experts from Organization for the Prohibition of Chemical Weapons launch probe into last week's attack in Douma. International inspectors on Sunday launched an investigation into an alleged chemical attack near Damascus last week, AFP reported. A team of chemical experts from the Organization for the Prohibition of Chemical Weapons (OPCW), based in The Hague, arrived in Damascus hours after Saturday’s joint air strikes by the U.S., Britain and France which came in response to the attack. They have been tasked with investigating the site of the April 7 attack in the town of Douma, just east of the capital Damascus, which Western powers said involved chlorine and sarin and killed dozens. 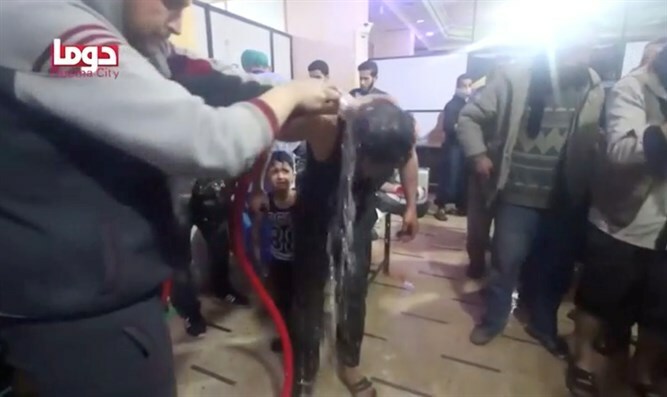 In February, the Hague-based organization opened an investigation into reports of the repeated use of chlorine bombs in the district of Eastern Ghouta near the Syrian capital. The fact-finding team usually starts its investigation by meeting top officials but any talks were held behind closed doors and both parties imposed a strict media blackout, noted AFP. "We will ensure they can work professionally, objectively, impartially and free of any pressure," Syria’s Assistant Foreign Minister Ayman Soussan told the news agency.